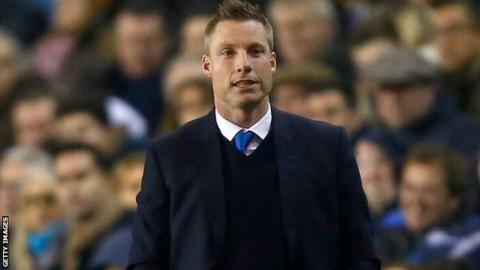 Millwall will not throw in the towel despite a setback in their survival bid, caretaker boss Neil Harris says. The Lions are four points from safety after Tuesday's 2-0 loss at Blackburn. "Nothing has changed. We are still in a difficult position but we are in a better position than we were four weeks ago," he told BBC London 94.9. "The bottom line is we need to win two games of football. It is time for me to put the players under pressure and say that Saturday we need to beat Derby." Millwall's position is perilous as Rotherham, who are one place above the south London club in 21st, have a game in hand and a superior goal difference. However the Millers could face sanction from the Football League for fielding an ineligible player, which includes a possible points deduction. Harris was left "disappointed but not despondent" following their defeat at Ewood Park, although he rued missed opportunities. "We were excellent and the chances we created were enough to win two or three games," the 37-year-old said. "Their goal was a sucker-punch and the second came with us pushing forward. "I won't fault my players for missing chances because they gave me everything I asked for. When it really mattered our quality let us down in front of goal again." Millwall face promotion-chasing duo Derby and Wolves in their final two games of the season but Harris said everyone at the club was remaining positive. "The atmosphere within the dressing room is outstanding. It is every bit as good as every good side I have played in at this place," he added. "The players deserve more and I feel for them. You can see the bond between the players and the fans. "We are in the relegation zone and they got a standing ovation to leave the pitch at Blackburn. That can't happen at many places. "The fans can see the players giving their all."